On Mondays through Saturdays around 12:30 p.m. you'll find Eva Kicanas on the recumbent bike working her legs and arms for about 45 minutes. Of course, a lot of people do that every week. But not everyone is 103 years old. 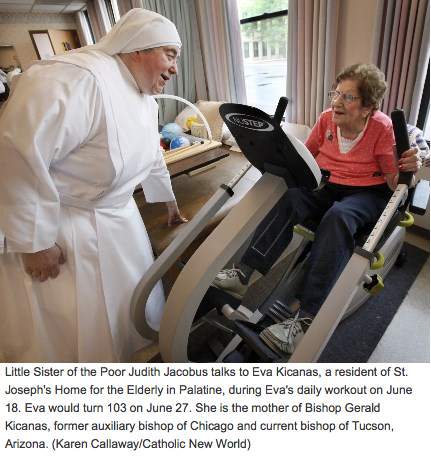 For the past nine years, Eva has made her home at the Little Sisters of the Poor St. Joseph's Home in Palatine. St. Joseph's Home has 34 apartments for low-income seniors and 63 nursing beds. Eva is the mother of Chicago native Bishop Gerald Kicanas of Tucson, Arizona. Bishop Kicanas previously served as an auxiliary bishop for the Archdiocese of Chicago. "She talks to the bishop a lot," said Diana Olson, director of development. "She's very proud of the bishop and her two daughters too." Her two daughters, Kathy Kerwin and Barbara Yarbrough, live in the Chicago area and often visit their mom. The whole family, including Bishop Kicanas, was expected to celebrate Eva's birthday June 27 at the home. Eva was born and grew up in St. Paul, Minnesota, and moved to Chicago after she married Frederick Kicanas. She's been a parishioner at St. Genevieve, 4835 W. Altgeld St.; Immaculate Heart of Mary, 3817 N. Christiana Ave.; and St. Tarcissus, 6040 W. Ardmore Ave., parishes. When Eva told her son she didn't need anything for her birthday this year he said he would offer the Mass for her. "She said, 'That's the greatest present he could ever give me,'" Olson said. For Eva's 100th birthday, her son gave her a framed papal blessing from Pope Benedict XVI and a greeting and congratulations from President Barak Obama and first lady Michelle Obama. The staff says Bishop Kicanas visits his mother several times a year and whenever he's in Chicago for meetings. "He was a wonderful boy," Eva told the Catholic New World of her son growing up. The young Gerald was very religious and wanted to be a priest, his mother said. "He would read the missal and say 'God, make me pure.' I always worried he didn't understand what that meant." What did she think when he was named an auxiliary bishop of the Archdiocese of Chicago in 1995? "I was surprised," she said. Little Sister of the Poor Judith Jacobus, a medical doctor in charge of the nursing unit, says Eva is always grateful for whatever anyone does for her. "She always has a pleasant smile," Sister Judith said. Thursdays are beauty parlor days and Eva is always first in line, not because she's vain but at 103 she still feels the importance of keeping up her appearance, Sister Judith said. The day the Catholic New World visited her hair was done, she wore red lipstick and her nails were expertly painted in a bright orange-red color. When asked what she thinks she's done that's enabled her to live to 103 she said, "I have no idea. I never dreamed I'd live this long."